Kitsch, tasteless and sycophantic. It’s no surprise Donald Trump likes this little piece of soon-to-be art history. There are certain paintings that impact on the history of art like like the asteroid that destroyed the dinosaurs. Picasso’s Guernica. Da Vinci’s Last Supper. The Roll Call by Elizabeth Thompson. Images that define how the world is seen, and how images are understood. Andy Thomas portrait of Donald Trump is not one of those images. But after being shot to fame by Trump’s decision to hang the painting in the White House, and its “accidental” television appearance soon afterwards, The Trumptoon (as I am choosing to call it) will, like it or not, forever be a footnote in art history. 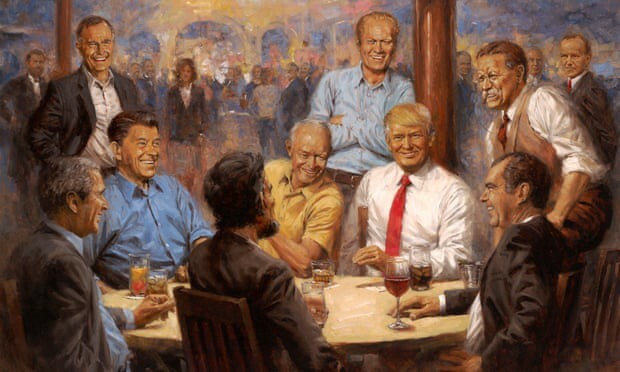 It’s a painting that Makes Art Great Again, just as Trump is doing the same to America. That Trump is slimmer than his real life self is perhaps the least sycophantic touch in The Trumptoon. Trump’s tie, a slash of eye catching scarlet, is placed precisely on the right-side 2/3 mark, at the heart of a composition that leads all eyes, as ever, to The Donald. Eyes, laughs and poses matter in the picture. Notably, none of the former Republican presidents are looking at Trump. But that only emphasizes his centrality. Instead the POTUS gang — because what is this but a crew, team or gang hanging with their leader— are all shown looking submissively away from The Boss, careful to avoid any hint of eye contact that might constitute a challenge to The Alpha Male. Trump himself is looking out at the world — at us. It’s the pose of a stand-up comic gifted his own primetime tv show, having just dropped the episode’s best one liner, then breaking the third wall to share the in joke with his loving audience. The Donald Trump Show also features Democratic presidents in walk on roles. But it’s Obama, like the Fonze or Kramer, who still gets the ecstatic applause when he enters, much to the titular star’s shame and annoyance. Did Trump drop a joke? Or are we supposed to assume he’s killing the table with some deep insight into political philosophy? Whichever, Donald has clearly blown away his dinner guests. The message could not be clearer. Trump, long derided as no true Republican, has now turned the tables. Trumpism IS Republicanism now. And even the legacies of long dead presidents will be dragged down into the gutter where modern day conservatism now resides. That Lincoln-like figure is carefully placed at the front of the table, back to the viewer. Sure, Trump is best pals with Roosevelt, their kids both like killing rhinos together. Nixon is Trump’s spirit animal. When it comes to presidential corruption at least. The Bush clan clearly don’t want to be there, but have run out of political capital to resist. Eisenhower warned us of the military-industrial complex and now here it is, buying drinks for the table. Reagan, in portraiture as in life, doesn’t have a clue where he is. Behind the beatific smile it’s 1954 and he’s shooting some B-movie —a long forgotten Western — The Trump Bunch, with John Wayne in the lead perhaps. But Lincoln. Lincoln, I think we all know, doesn’t belong in this picture. Or any picture of American presidents that includes Donald Trump. So instead his presence is more hinted at than confirmed — when he turns around, we see it was Jared Kushner in a chin wig all along. There are two futures ahead of The Trumptoon, and any conservatives reading will be happy to know that they get to choose between them. In one, this travesty of political portraiture becomes the de facto image of modern conservatism. Trump becomes the historic face of the GOP and all it stands for. In another, less likely timeline, anyone stumbling on this painting will wonder how a trust fund kid turned failed gangster turned political huckster turned Russian collaborator ever got into such august company. But maybe I’m an optimist. Maybe conservatism has always been as low as Trump makes it, and was only ever pretending to a higher morality of any kind.